Cogent Labs will accelerate the hiring of researchers and engineers from top universities and companies from around the world. The team’s diversity of culture (more than 10 countries) and professional backgrounds (e.g. physics, statistics, neuroscience, machine learning) yields a creative advantage in developing applications of AI technology. They will additionally hire skilled designers and UI/UX experts to better connect their AI applications to their customers. 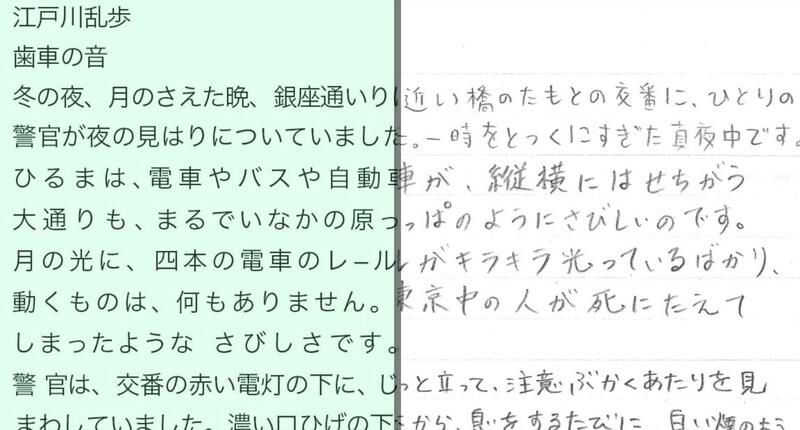 Tegaki (https://tegaki.ai) perceives and digitizes handwritten Japanese text – a task which is not adequately solved by competing technologies. Tegaki improves efficiency and reduces costs for manual data entry tasks, regardless of industry or size of business. The service is provided as an API, allowing customers to easily develop and integrate its capabilities for their needs. * Tegaki can be customized to read many kinds of documents. * The service is still in the process of development and some specifications may differ from the product. The Tegaki service is powered by Cogent Labs’ Perception technology which can be used for a broad range of perception tasks, visual and otherwise. Cogent Labs will continue improving the Perception technology as well as other AI technologies. Cogent Labs is actively developing its next generation Understanding technology which will be used to understand the structure of natural language and the contextual relationships between entities and concepts. In addition the team will continue its active research in the application of AI to high dimensional financial data. SBI Investment Co., Ltd. (head office located in Minato, Tokyo; Representative Director and President: Katsuya Kawashima) is the core company in the SBI Group’s Asset Management Business. As one of Japan’s leading venture capital firms, their management of venture capital funds is guided by their mission to become a leader in the creation and cultivation of key industries for the 21st century. As a “New Industry Creator”, they provide privately held ventures with risk capital through fund investments that support business developments and progress of these companies. Their efforts have generated a succession of IPOs and contributed to the well-being of society. TOPPAN FORMS CO. LTD. (head office located in Minato, Tokyo; President & COO: Koichi Sakata) has extensive technology and know-how in the business forms and data print service fields. They serve as a strong basis for an information solutions company which optimizes information transmission for customers. They cover a wide variety of information-based businesses, such as integration of printed matter and electronic documents, information media like RFID and IC, and development of products compatible with printed electronics technologies.